Factory class to produce IVSFABs. Factory class to produce IVSFABs. This is needed for LevelData construction. References LayoutData< T >::boxLayout(), LayoutData< T >::dataIterator(), LayoutData< T >::define(), IVSFABFactory< T >::m_sets, and LayoutIterator::ok(). Creates a new baseivfab object and returns a pointer to it. Responsiblitly for calling operator 'delete' on this pointer is passed to the user. Intersects a_sets[a_dit] from construction with input box because leveldata will expect that anyway when it tries to do a copy or a linearization. 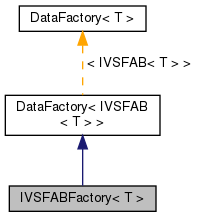 Implements DataFactory< IVSFAB< T > >. Referenced by IVSFABFactory< T >::create(), and IVSFABFactory< T >::IVSFABFactory().